While denying negligence by one of its premier bio-weapons labs, the government has agreed to pay $2.5 million to settle a wrongful death suit filed by survivors of the first fatality victim of the deadly 2001 anthrax mail attacks, court papers revealed Tuesday. The money will go to the widow and children of Robert Stevens, a Florida-based photo editor for the National Enquirer and other tabloids who was the first of five people to die after inhaling the tiny spores. The settlement ended a secrecy-shrouded, eight-year court fight shortly before U.S. District Judge Daniel Hurley of West Palm Beach, Fla., was due to either grant a Justice Department motion to dismiss the suit or to send the case forward to trial. 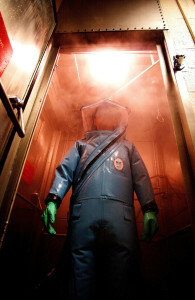 By settling, the government protected from public scrutiny a sizable cache of documents about its secretive biological weapons program. At issue was whether a leading U.S. Army bio-weapons laboratory in Frederick, Md., was negligent in failing to adequately secure its anthrax stocks, possibly enabling a mentally troubled researcher at the lab to carry out the attacks. Bruce Ivins, the researcher whom the FBI fingered as the anthrax mailer shortly after his 2008 suicide, studied anthrax for more than a quarter of a century at the lab, the U.S. Army Medical Research Institute of Infectious Diseases (USAMRIID) at Ft. Detrick. While the FBI never turned up hard proof that Ivins carried out the killings, the bureau amassed a circumstantial case against him. Regardless of whether Ivins was the perpetrator, sophisticated genetic tests showed that a flask of anthrax under his control contained the same genetic markers as those in the deadly spores found in the letters, suggesting Ivins’ anthrax may have been the parent material. As many as 219 people had access to spores distributed from Ivins’ flask, government documents have stated. The suit was the only one to progress so far on behalf of any of the 22 people sickened by as many as seven anthrax letters mailed to media outlets in New York and Florida and to the Washington offices of two U.S. senators. At least a dozen attorneys from the Justice Department’s Civil Division aided in defending the suit. Even so, they caused a major embarrassment last summer when they said in a court filing that Ivins lacked the specialized equipment in his containment laboratory needed to produce the anthrax used in the attacks. Chastened by the FBI and the department’s Criminal Division, they soon filed 10 corrections withdrawing their assertions. Lawyers for Maureen Stevens and her children vacillated during the case on whether to accept that Ivins was the killer. They ultimately contended that the government shouldn’t have permitted him to work with a deadly pathogen such as anthrax after learning he was receiving treatment for mental health problems. In any event, they argued, security at the lab was so lax that a tiny amount of anthrax could have been whisked from the facility in any number of ways and used to grow the trillions of spores used in the mailings. The government countered that taxpayers aren’t liable under the Federal Tort Claims Act for unpredictable violent behavior by a federal employee. The settlement was reached solely for the purpose of “avoiding the expenses and risks of further litigations,” it said. Lawyers for Stevens’ family, who are limited to $625,000 in legal fees, are required under terms of the settlement to promptly return to the government all protected documents. Stevens was a photo editor in the Boca Raton, Fla., offices of American Media, Inc., publisher of the National Enquirer and other tabloids. He died on Oct. 5, 2005, a couple of days after taking ill. While no anthrax-filled letter was found at American Media, laboratory analysis of his spinal fluid indicated that he inhaled the same strain of anthrax found in four recovered letters. Lawyers for both sides declined immediate comment on the settlement.